Imagine that you have been riding for a couple of years. You are getting to be quite a good rider, but riding is something you love more than any other sport. You have finally convinced your parents to buy you a pony.Good job! Now, you want a pony with a friendly temperament and one that is easy to manage. Maybe you can suggest the Welsh pony to your parents.You can impress your parents by telling them that the first Welsh ponies were found in Wales around the time of the Roman Empire. They learned to cope with cold weather conditions there. They have sturdy bones and strong hooves (their feet). They developed those strong feet and bones because they spent many years running through rough hills and mountains in Wales. You can even tell your parents that Welsh ponies are not picky eaters. They used to live on little bushes and grass when they lived in Wales.Welsh ponies are not fickle and extra sensitive like Thoroughbreds so you know that your pony will be a special friend for you. He will also do well in horse shows because you know he will have a pleasant temperament and he will always try his best to please you. Even though your Welsh pony has a friendly disposition, you will need to have taken lessons for some time because little ponies will try to outsmart you sometimes. If you don’t correct them, they can get bad habits. 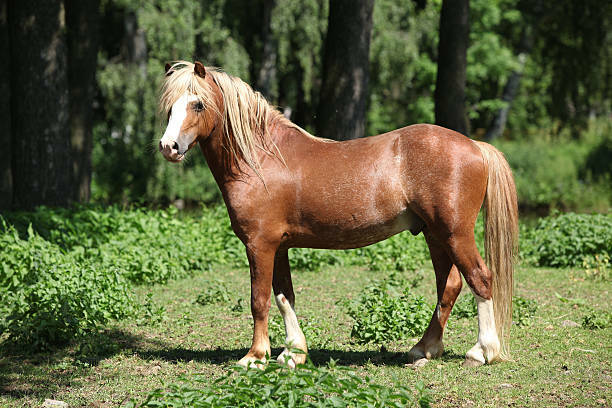 Do you know what size Welsh Ponies usually are? They are often smaller than 13.2 hands high (that would be 52.8 inches) The Welsh pony will be a great first pony for you, as long as you remember that they are very intelligent and can develop bad habits quickly. Be sure to correct your pony whenever he does something he shouldn’t and you’ll be a winning team! I hope you’ve enjoyed learning about these adorable, talented, ponies.